The A5 strikes a balance between the comfort focused Mercedes C-Class and driver-engaging BMW 4 Series well. So is it the best in class? 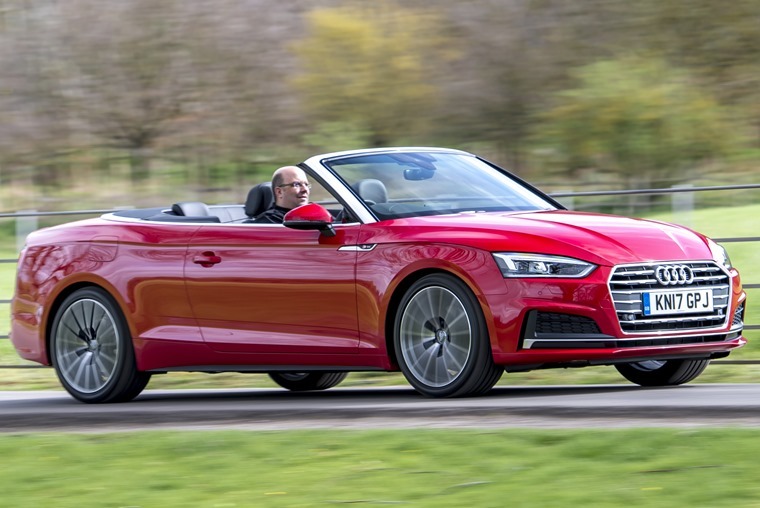 The old Audi A5 cabriolet flew out of showrooms for around eight years, two fewer than the coupe upon which it’s based. In that time it’s managed to build a reputation of a safe and solid piece of kit, presenting a suitably premium image with sporting intent, just so long as you never actually cashed in that sporting cheque. The new version builds on that promise, offering something that’s very much exactly the same while being slightly different at the same time. That means it’s now based on Audi’s MLB Evo platform and inherits the sharp-edged styling of the new A5 coupe that we drove in August last year. It’s attractive then, with a long, sloping nose adorned by a huge Audi grille giving way to strong creases along a curvaceous body that is actually marginally narrower than the previous model. That long bonnet hides a 2.0-litre turbocharged petrol engine that develops 249bhp. That long bonnet hides a 2.0-litre turbocharged petrol engine that develops 249bhp, enough to propel the A5 from a standstill to 62mph in 6.3 seconds. 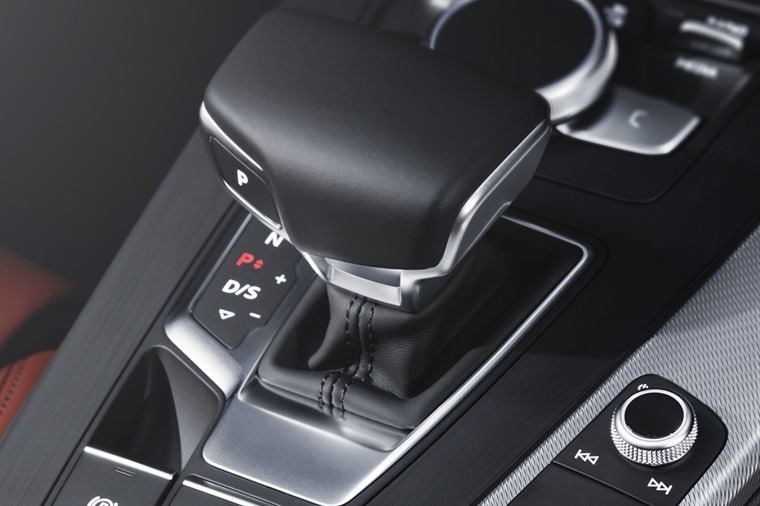 The tricky task of keeping up with the gears is handled by a seven-speed dual-clutch automatic gearbox that makes a good fist of keeping up with demands. A torque figure of 370Nm makes the car feel surprisingly zesty, as there’s plenty of thrust from as low as 1,500 revs. Pushing hard on the throttle releases all the power, but it’s not a particularly pleasant sensation, and the car itself doesn’t really promote a sporting mindset. There’s plenty of thrust from as low as 1,500 revs. Audi has made efforts to improve matters, shedding some weight so that it tips the scales 55kg lower than before. However, in a car weighing north of 1.7 tonnes that makes a pretty negligible difference. 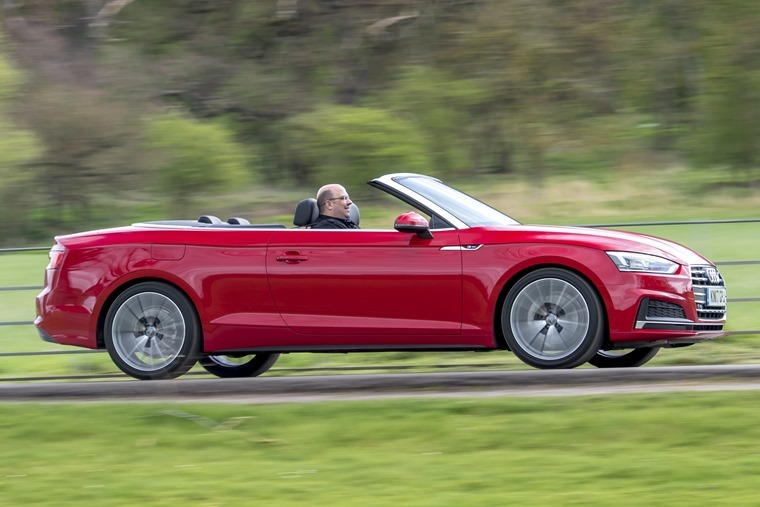 The heavyweight statistics come down this test model being provided in quattro spec, the four-wheel drive system adding a fair chunk of heft to the cabriolet. Truth be told, the system adds little to the car beyond that extra weight. There may be a slight improvement in perceived grip levels in the wet, but the standard front-wheel drive setup is predictable and secure, throwing up no unpleasant surprises. 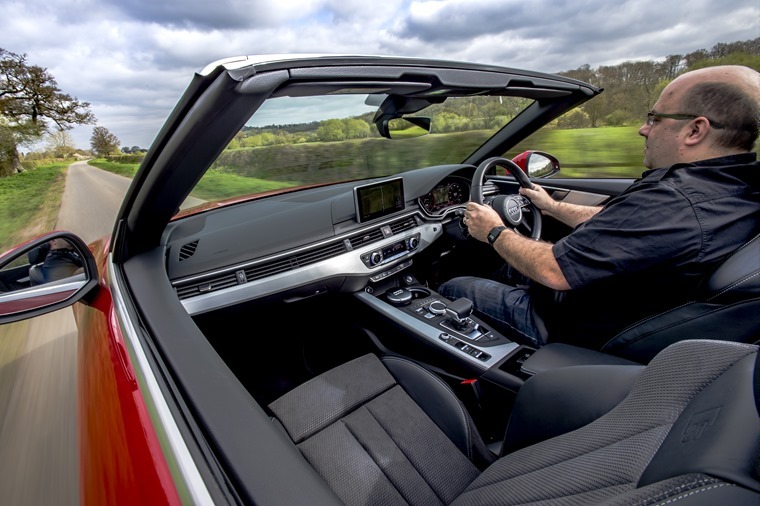 The 2.0-litre diesel option is surprisingly refined and well insulated, even with the roof down. Surprisingly, it might also be worth looking at other engine options - the 2.0-litre diesel is surprisingly refined and well insulated, even with the roof down, and offers real-world economy of 40-50mpg, compared to the 25-35mpg of this petrol option. Officially it’ll manage 43.5mpg, but that’s optimistic at best. If it’s performance you’re after then the S5 will be a better option. A smooth 3.0-litre V6 petrol engine produces a formidable 354PS of power, which should keep anyone happy until an RS5 undoubtedly appears in a year or so. The interior is disturbingly quiet, allowing you to easily forget that the top comes off at all. Back in the real world, and putting aside any sporting pretension, the A5 Cabriolet is a glorious place to spend some time. With the roof up - something that can be done at speed of up to 30mph and takes 18 seconds or so - the interior is disturbingly quiet, allowing you to easily forget that the top comes off at all. Fold it back down and it hides away under a hard cover, with no loss of boot space thanks to some clever packaging. There’s a wind deflector that sits above the rear seats and makes an effort to keep a stiff breeze away from your neck, but the loss of those seats could be an issue for many. Fortunately the full wind-in-the-hair experience can be had with four passengers in the car, and remains a pleasing unruffled experience up to about 60mph. You’ll want the ide windows up before then though, and the top up soon after, where even those in the back won’t be complaining about a lack of headroom. As with the Coupe, the interior is first-rate, with excellent quality materials chosen throughout. The wheelbase is slightly longer than the outgoing model, so there’s marginally more legroom in the rear as well. 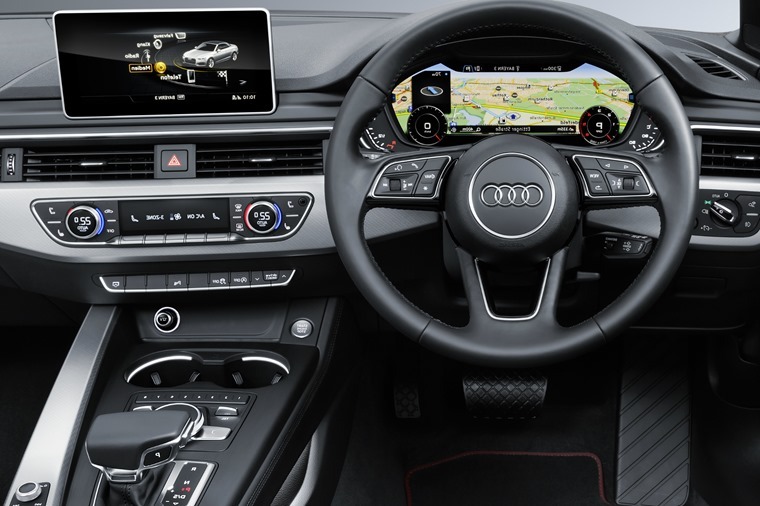 As with the Coupe, the interior is first-rate, with excellent quality materials chosen throughout and a perceived build quality that's second to none. It retains, therefore, everything that makes the A5 Coupe so appealing - just enough space to justify calling it a family car, a discrete but purposeful sense of style that oozes status, enough refinement to pound the motorways in relentlessly without issue, and enough performance to entertain on the odd roundabout exit here and there. Is it the best in class? There are very few models to compare with in this segment, the premium four-seater convertible being something of a niche within a niche, but the A5 strikes a balance between the comfort focused Mercedes C-Class and driver-engaging BMW 4 Series well.